The utilization of resources in multiple cascade stages can improve the resource efficiency of product systems. 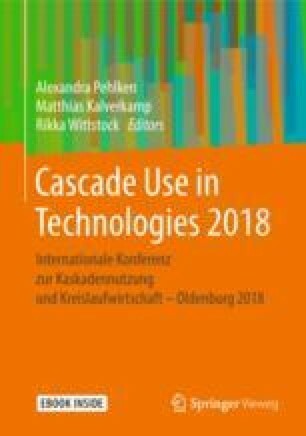 This paper discusses a method by which a comparison of cascaded utilizations can be achieved despite the multi-functionality of such systems. Based on a comparison of the cascaded utilization with an equivalence system, potential reductions in impact indicators can be identified. In a case study, four scenarios for the cascaded utilization of a rotor blade are developed on the basis of a literature review. Potential reductions in the impact indicators Cumulative Energy Demand (CED) and Cumulative Raw Material Demand (CRD) are calculated. The main results of a review of the method are twofold: (i) The selection of the equivalence systems has a decisive influence on the result of the study and (ii) the approach requires a high data diversity and availability. We thank our colleagues from the Research Group Cascade Use, in particular Dr. Alexandra Pehlken, who provided insight and expertise that greatly assisted the research.